Our office is open from 8am–4.30pm Monday to Friday. School families can email staff members via Compass. School families can email staff members via Compass. There is limited car parking on campus, but plenty of bike parking. Tram number 11 runs along St Georges Road. Stop 26 (Clarke Street) is in front of the school. Merri station is the closest train station. Walk west 300m to St Georges Road. 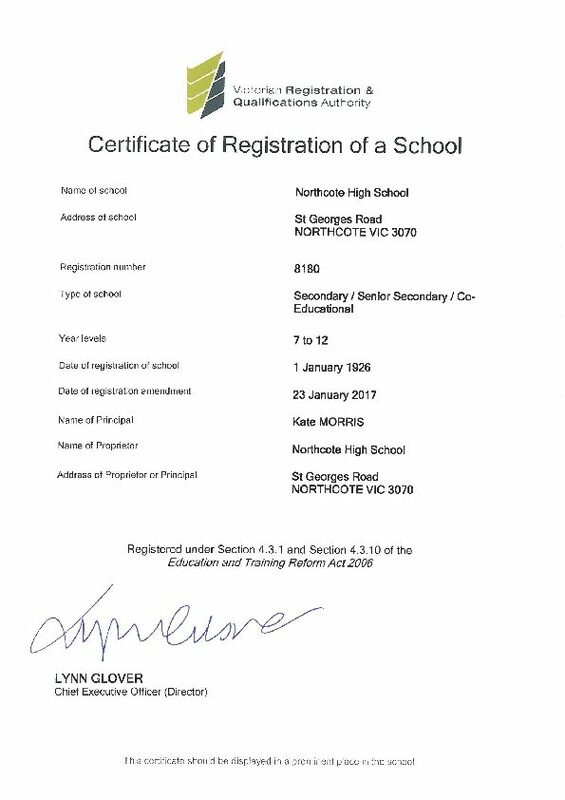 Northcote High School is committed to making sure that the information on this website is available to the widest possible audience. Every effort has been made to comply with Level AA of the W3C (World-Wide Web Consortium) Web Content Accessibility Guidelines (WCAG) 2.0. This website uses some PDF (Portable Document Format) files, also known as Adobe files, to make documents available online. To open, print or save a PDF file, you will need Adobe Acrobat Reader. If you do not already have this tool, you can download it for free from Adobe. Contact us if you trouble opening or viewing a PDF file and we will provide the information in a format that suits your needs.